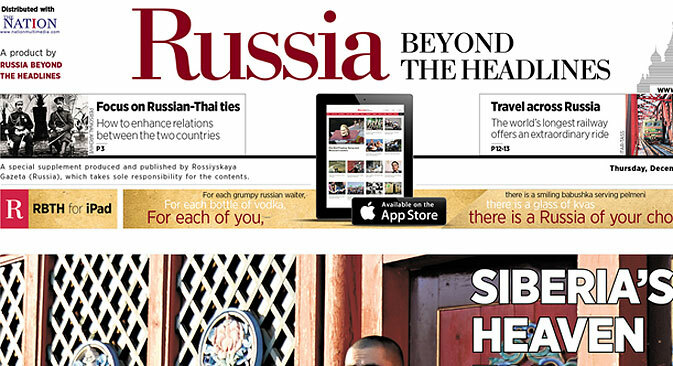 Russia Beyond the Headlines has released its first print edition in Thailand. The English-language supplement appeared on Dec. 12 in The Nation, one of Thailand’s leading newspapers, and in the Phuket Gazette in the resort town of Phuket. Abov added that RBTH hopes to become recognized as a source of quality information about Russia tailored specifically to appeal to Thai readers. The Russia Beyond the Headlines supplement is a 16-page tabloid-size newspaper, with a total circulation of some 68,000 copies. It will appear regularly in 2014. Stories covered in the first edition include: bilateral cooperation, Russians' interest in real estate abroad; Russia's priorities in the Asia-Pacific Region; the 400th anniversary of the Romanov dynasty and a feature on the Trans-Siberian Railway. "Russia's modern foreign policy is aimed at cooperation and integration with ASEAN countries. Thailand is one of Russia's key partners in that region. Suffice to say that this year the number of Russian tourists visiting Thailand has exceeded a million people. At the same time, due to the lack of quality information and reporting, Russia's image in Thailand is not as good as it could be. That was one of the reasons for launching this supplement. We think it's high time our countries spoke to each other directly," Abov said. Russia Beyond the Headlines is the international project of Rossiyskaya Gazeta. Since 2007, it has published monthly supplements about Russia in leading newspapers around the world. Currently, the project works with 28 newspapers in 16 languages in 22 countries. The overall circulation of RBTH supplements is approximately 10.5 million copies, reaching an audience of over 32 million people. The RBTH (www.rbth.ru) multimedia portal is available in 14 languages and two regional versions. RBTH on-line resources also include special themed sections, a mobile version of the site and an English-language iPad application.